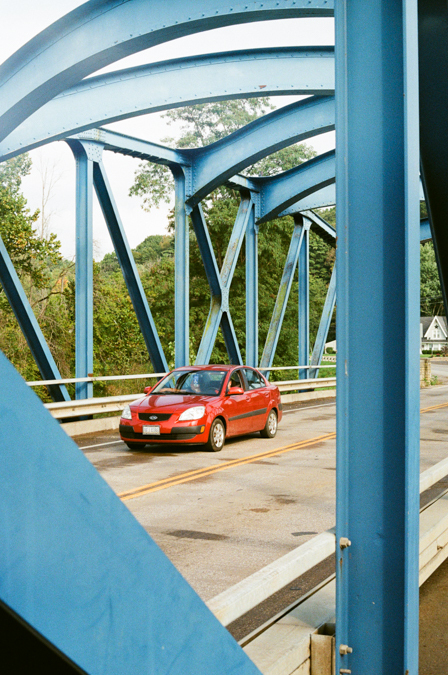 Cincinnati to Cleveland with a Minolta XD-11. - Mt. 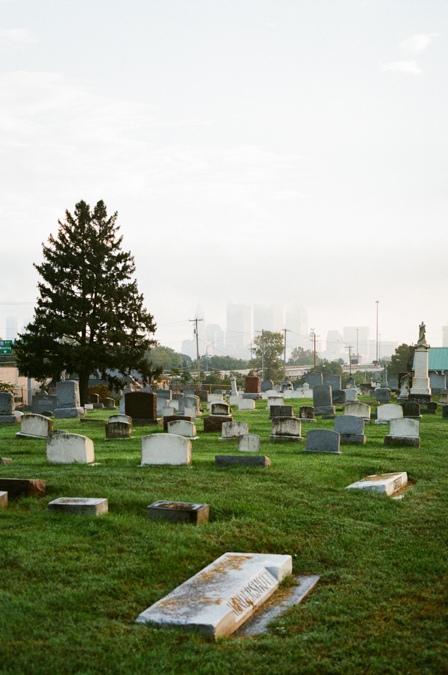 Cavalry Cemetery, Columbus. I somewhat laid it out in a previous post: I’m going to be traveling a lot through the State of Ohio for awhile. I have a love/hate relationship with road trips. They're an opportunity to see something new, but can also become overbearing. 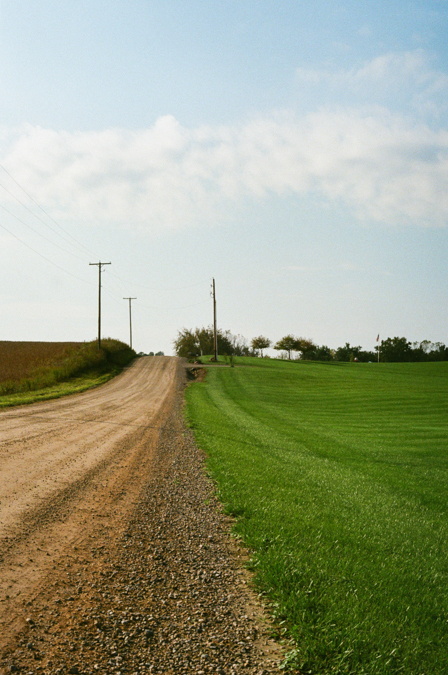 When possible, I’ll catch back roads instead of the interstate (a notion developed out of a love for the book Blue Highways). Even as someone who wishes he lived in a nation of high speed rail (or even just the option of rail between Ohio’s three major cities), I always get excited about extended time on the highway. I spend time researching and planning during the days before. I write down lists in my notebooks of what I want to see, where I want to go, how much time I’ll need, etc. Sometimes it works out. Other times I find myself just wanting to get home. Most times, it falls right in the middle—I enjoy my time, but get restless from sitting in the car or annoyed when I’m not finding anything “interesting” to photograph or see. I’ve had delicious meals in great roadside diners and disappointing conversations in chain restaurants near highway exits, so to speak. Nevertheless, the enthusiasm and the planning are always there at the start. With these particular trips between Cincinnati and Cleveland, there’s a ton of things I’ve wanted to see for awhile or places I’ve wanted to revisit—I’m no stranger to traversing this state (and others) in an automobile. 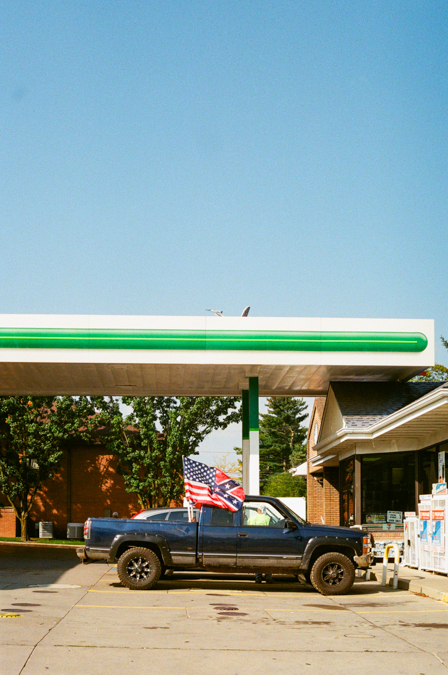 With recently getting back into 35mm and wanting to change up my perspective on photography a bit, I’ve been documenting these trips solely with film. That worked out “ok” on the first go-round, but this particular time was a bit more successful and the sights from the road more rewarding (seeing my girlfriend at the end of the drive is always great, but the trip to and fro hasn’t always been smooth sailing). I wasn’t leaving until Saturday morning. I knew I’d have to work a bit late on Friday afternoon and that Laura would be busy up in Cleveland until Saturday afternoon. The evening light was also starting to fade sooner these days as Fall approached, so departing Saturday would give me more time to shoot and wander. I figured I’d get home from work, go for a run, eat some pizza, pack, and be asleep by 9 p.m.—ready to get up the next day and in the car at 4 a.m. That plan would put me in Columbus near sunrise and allow for hours of being free to roam after in the world between the capitol and Cleveland. But I couldn’t fall asleep watching bad movies (why is DC Comics even bothering? ), nor did some melatonin help. Then the trains started coming by and the neighborhood brewery introduced a cover band. "My Sharona" came out of the brew factory and into my bedroom clearly. I got hungry, drove to get some food, and finally fell asleep around midnight during an episode of Battlestar Galactica. I woke up naturally, without the help of digital alarms that had been blaring for hours. I was going to be starting late. I was annoyed. At 6:30 a.m., two and a half hours later than I had planned, I grabbed my bags and cameras. A few podcasts later and I was in Columbus, the sun firmly above the horizon, casting light through haze and fog. I decided to make my first stop. 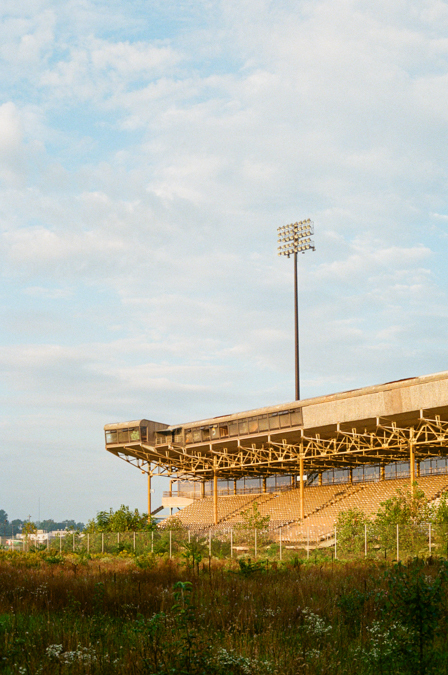 Cooper Stadium, an abandoned minor league ballpark, was a place I had been to briefly years ago when I snapped a few frames from the outside as opposed to my more traditional exploits. 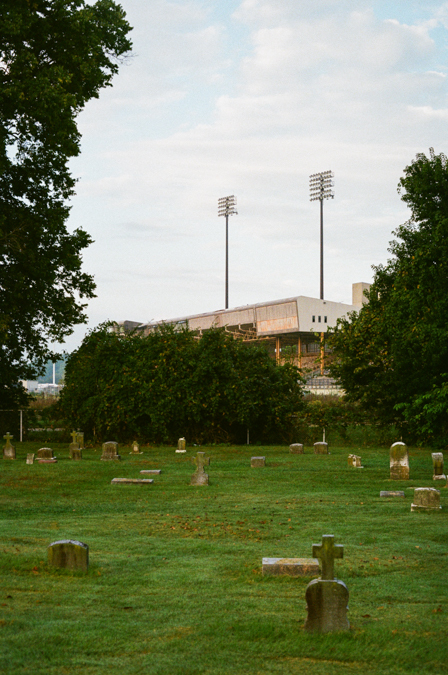 The stadium sits near a cemetery, Mt. Cavalry to be exact. I pulled in, trying to be as respectful as possible, even as the only one amongst the graves. I wasn’t there to mourn, but rather, to get a glimpse of the city’s buildings covered in fog behind this dramatic landscape of eternal rest. 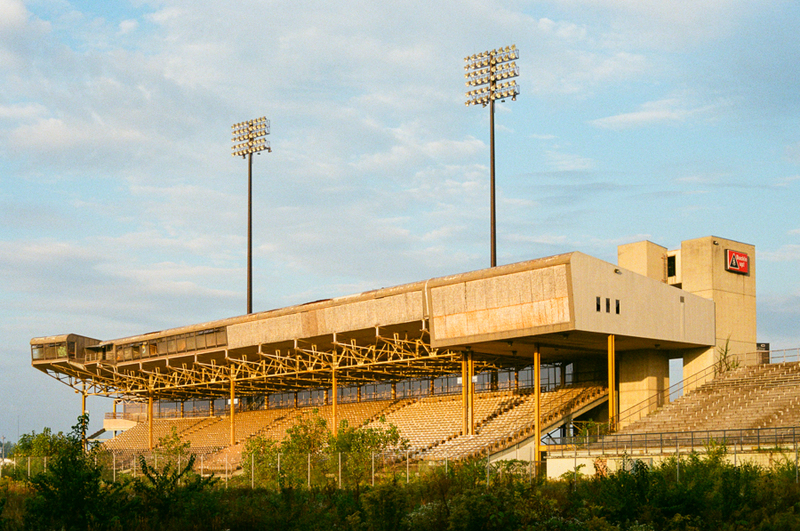 On the reverse side, there was the old ballpark, its former luxury boxes boarded over with wood. - Cooper Stadium as seen from Mt. 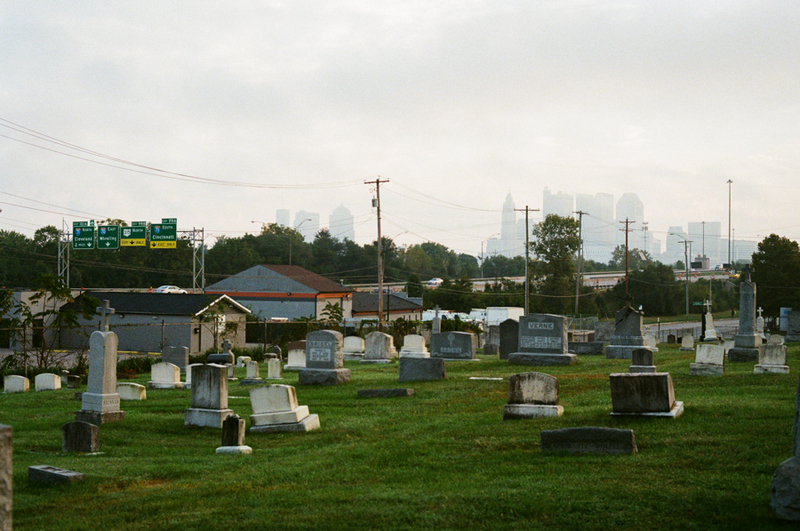 Cavlary Cemetery. 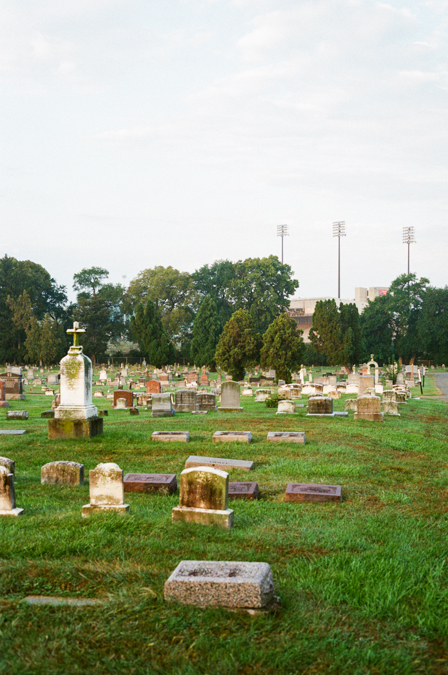 I left the cemetery and swung by the stadium, its playing surface long gone and overgrown. - Cooper Stadium grandstand, Columbus. Back on the highway, I swung by some roadside monuments: a lighthouse to the lord and a statue dedicated to the fast food clown I share a name with (but am pretty sure I'm not named for). - East Mt. Olive Baptist Church, Columbus. 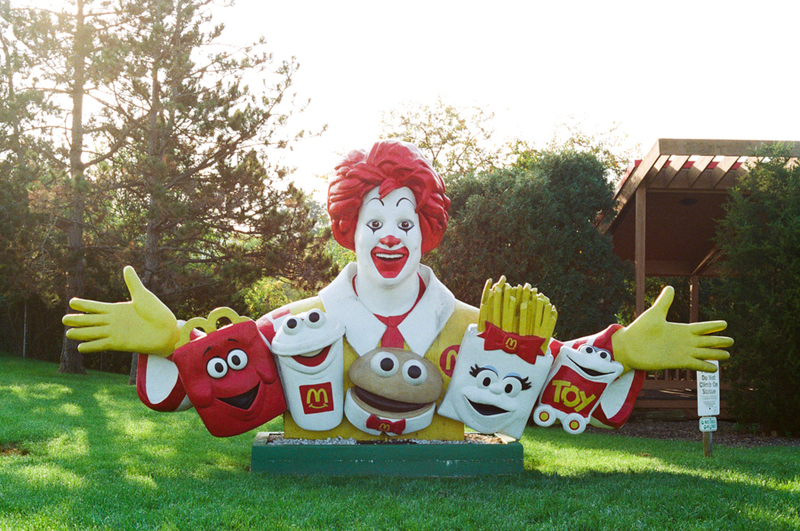 - Ronald McDonald Simulacrum, Sunbury. I’d like to think that I overcame the urge to eat McDonald’s because I’d been sticking to my diet, but I tend to ignore any semblance of an eating plan when traveling. It’s a lot easier to justify fast food on these trips—to imbibe golden, delicious hash browns or a massive cheeseburger washed down by real Coke as opposed to the diet stuff. Only because the drive-thru line was too long, though. My lack of patience will always supersede the temptation of trans fats, even if the McRib is back. 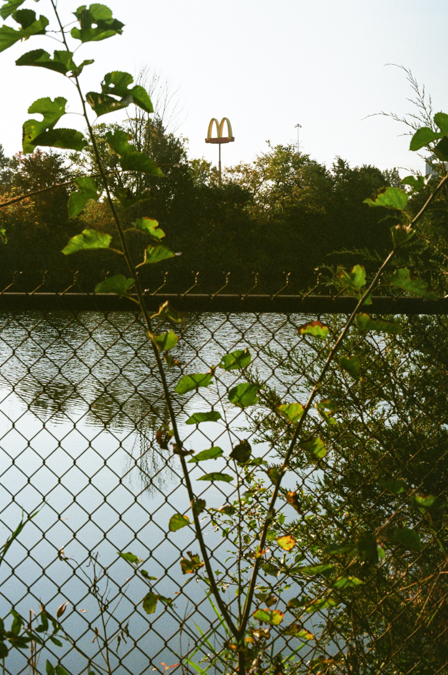 - Golden arches on a golden pond, Sunbury. 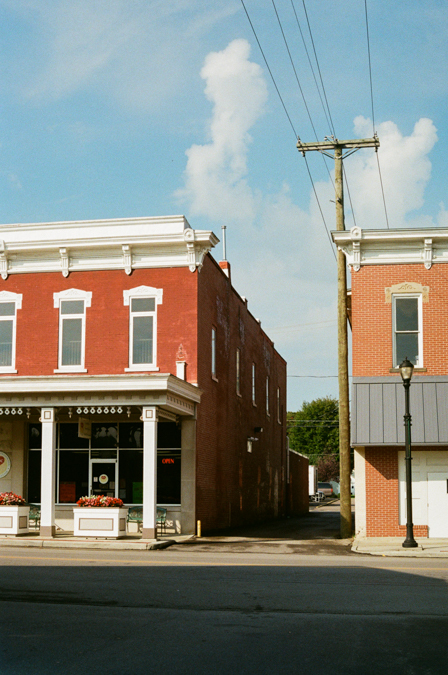 I stopped in the small town of Centerburg. If there was a diner or good, local spot to get breakfast along the main road, I missed it amongst the antique shops and those proselytizing about “the right choices” in the upcoming election. I got aimless for a bit outside Mt. Vernon and then got stuck behind a tractor near what I think was Belleville. I switched between pavement and dirt constantly until Mansfield where I picked up the interstate again. - Mt. Vernon (I think). - Presumably Mt. Vernon or Bellville. - County Road 57, Mansfield. In Lexington, OH, I stopped for a quick lunch, drawn like a moth to a flame when I saw a 7/11. 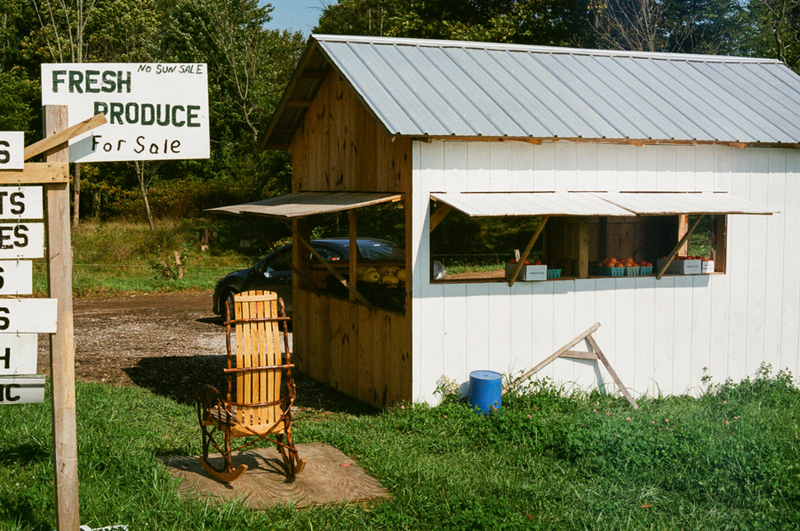 Cincinnati is absent of convenience stores and gas stations that offer good food. There’s no Sheetz or Wawa in my section of the state. 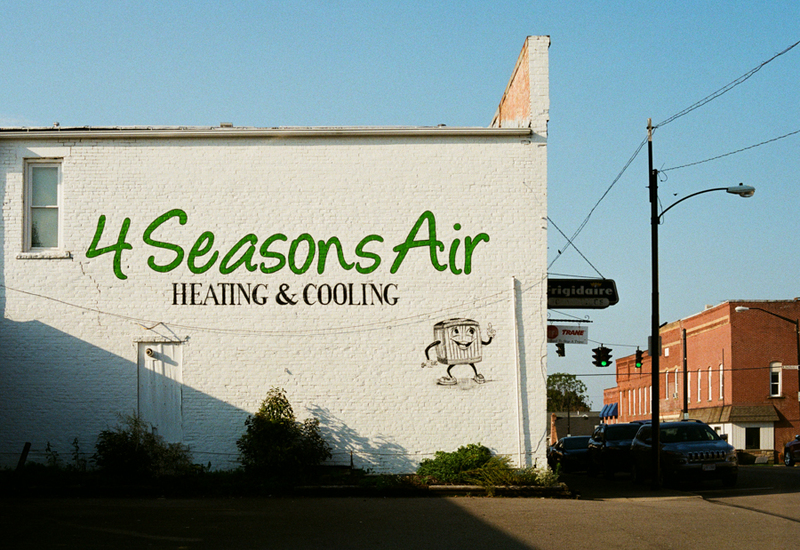 There’s UDF, which has great ice cream, but there's nowhere to get a good hot dog, corn dog, slice of pizza, or other totally unhealthy and questionably prepared sustenance that earns you cash back on gas. I settled on two slices of pepperoni. 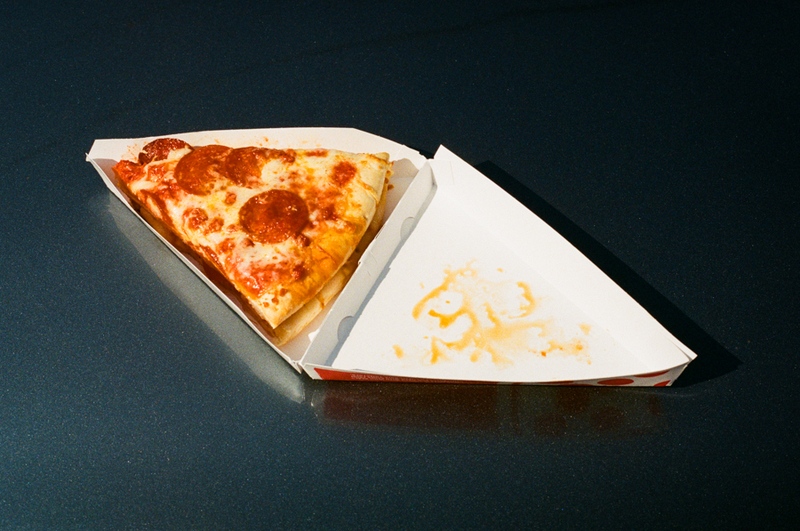 I doubted any of what was printed on the box, but the pizza was still good. I ate it while watching a truck pull up with a Confederate flag as well as an American/Confederate hybrid. I gotta say, I was a bit surprised to see the battle flag of a military force that fought against the Union to preserve slavery—and lost—displayed so brazenly this far North. But then again, nothing should be surprising these days. The three people crammed up front behind a dash board loaded with dip cans argued while their banners of ignorance fluttered in the wind. I picked up the interstate again and eventually jumped back off in Polk. 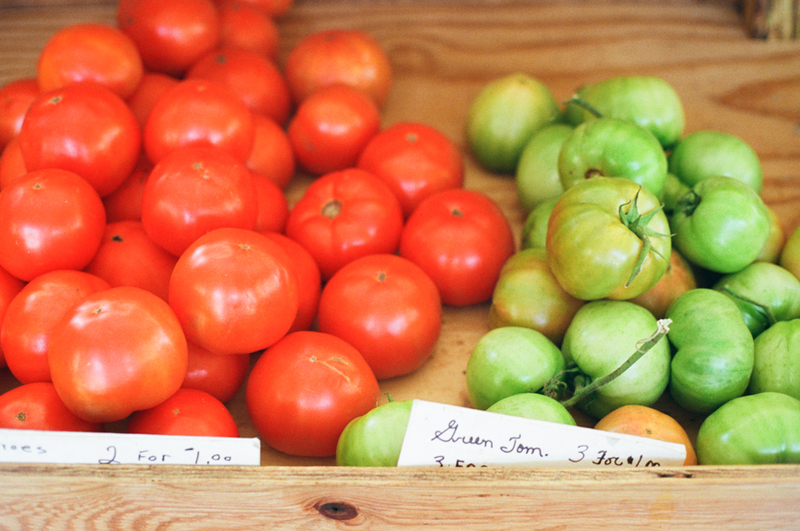 I stopped at a produce stand that wasn’t staffed. A young girl, in what I assumed was Amish (or some derivative of Amish) garb walked out from the house waving her hands. 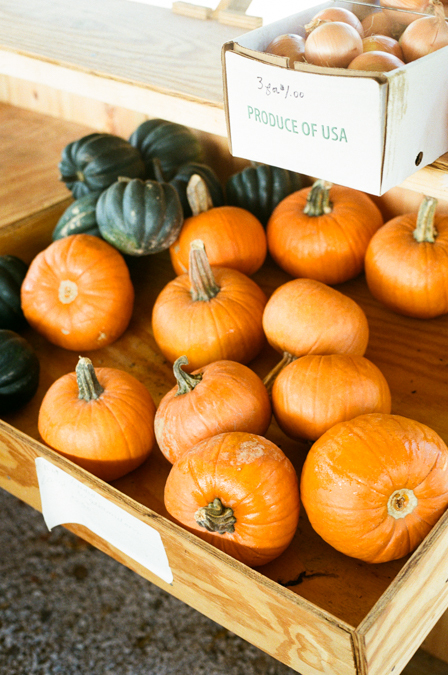 I picked up a few pumpkins and some fruit that could maybe make me feel better about eating gas station pizza. I snapped a few quick pictures of the store and turned around to see the young girl hiding from the camera. I assured her I would never take her photograph without asking and that she wasn't in any of the frames I had just made. She politely nodded, asked for a $1.50, and I obliged. 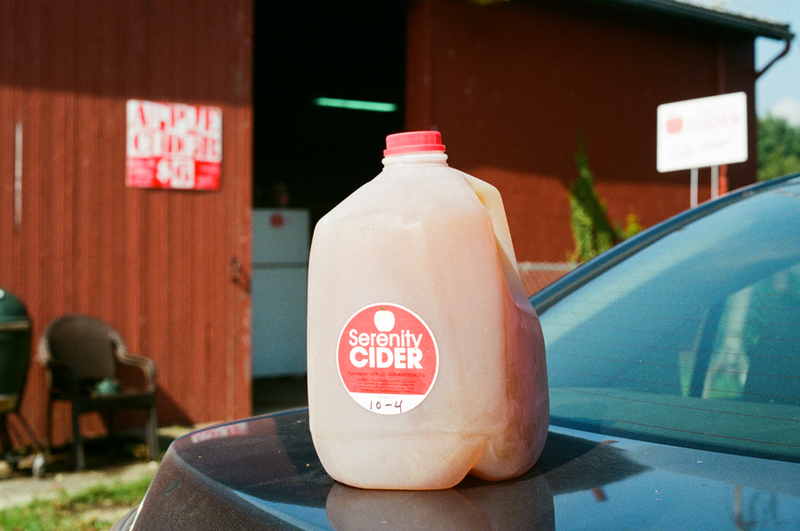 Down the road, I found “Serenity Now,” a proprietor of homegrown cider. 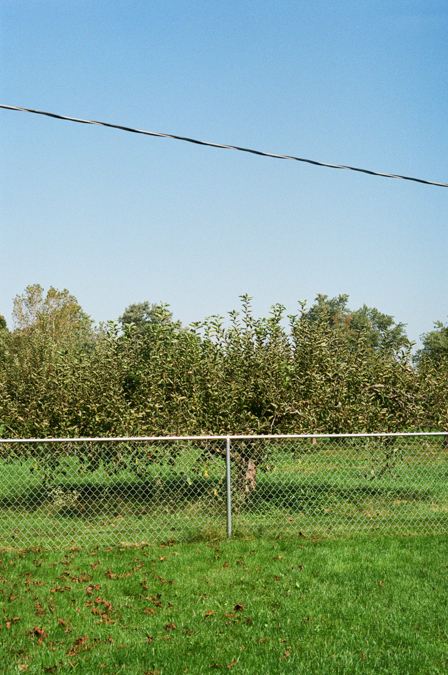 The owner jumped off his lawnmower when I pulled up, selling me a gallon of the drink yielded from the orchard in his yard. We had a good conversation about Seinfeld and our favorite episodes. 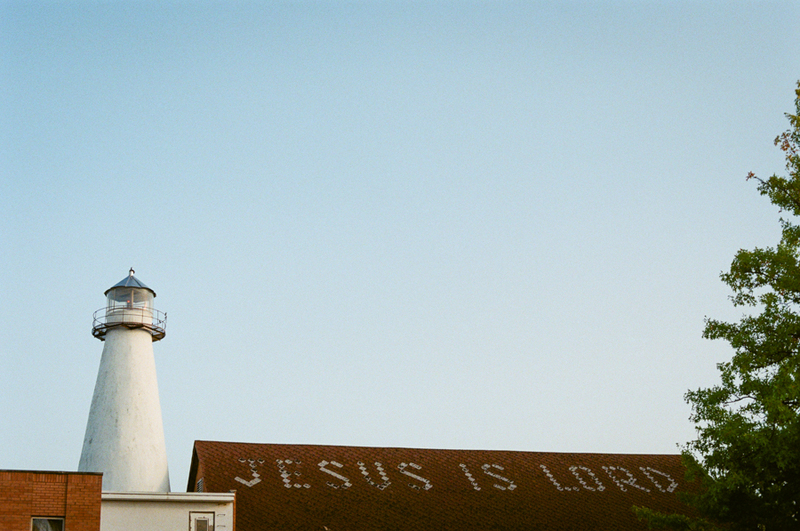 I finished off the roll of film and headed to Cleveland, having seen enough for the day and also out of time. 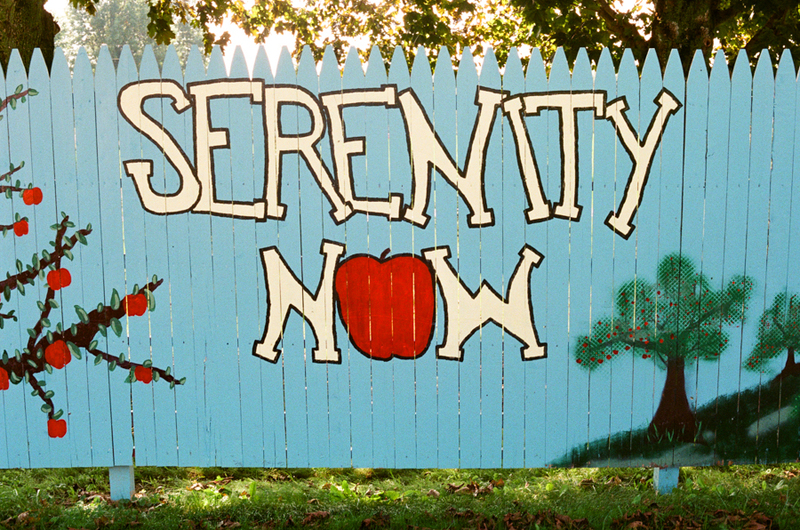 - Serenity Now Orchard, Ashland. 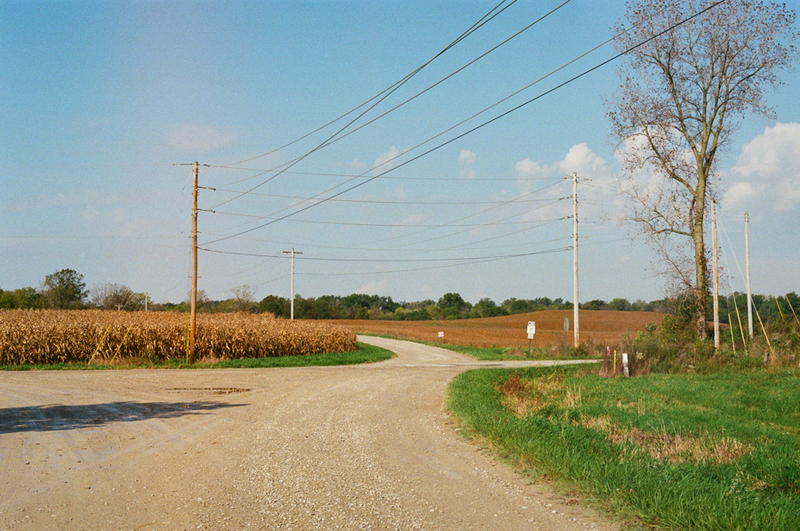 35mm Ohio is an ongoing documentation of road trips throughout the state. 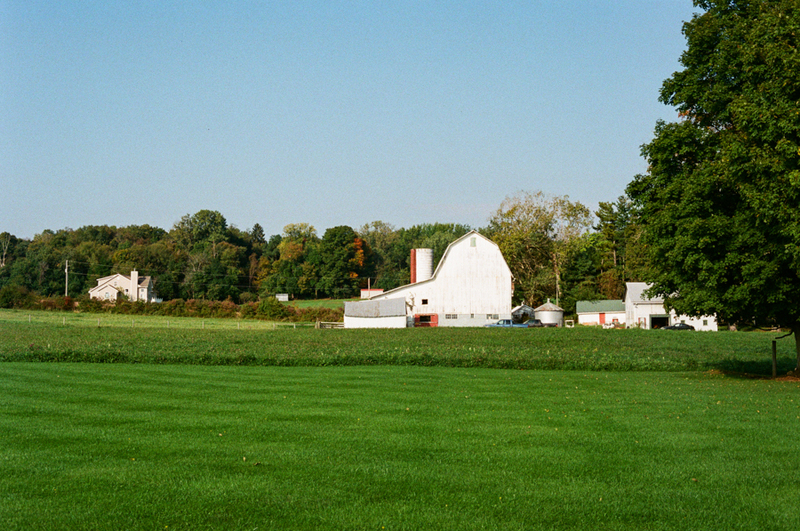 Next post: "Cleveland, a National Forest, Akron, an Outlet Mall, and Standard Suburbia." Thanks, Susan! I'll have some more up tomorrow. Great stuff! 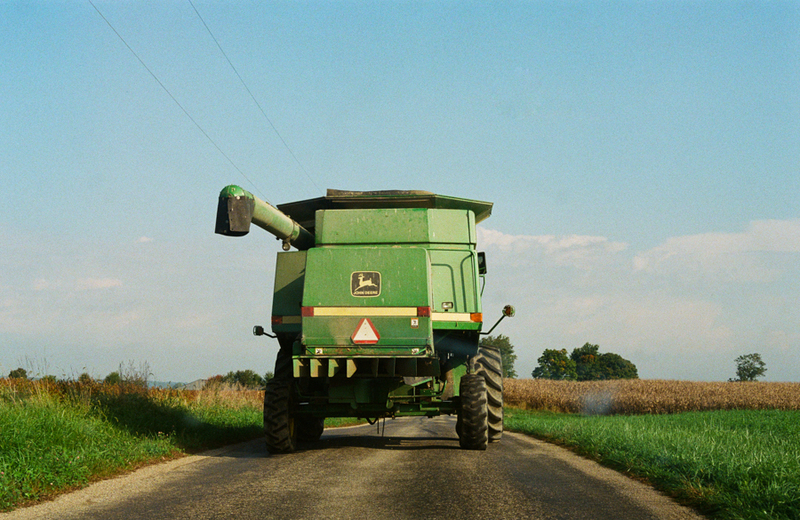 I've traveled between the Akron area & Columbus plenty of times, but not really the back roads. I also echo your road trip sentiments. As much as I love a good road trip, there are parts of them where I wish I was just done driving already. Akron was kind of a whole new world of Ohio for me. Next time I need to catch the blue highways south instead of heading towards 71. Such a cool city. Flag of ignorance... great stuff. You should check out Xenia some time, its underrated. Definitely on the list for another round. Might wait till it’s warmer, but I’ll need to divert that way. 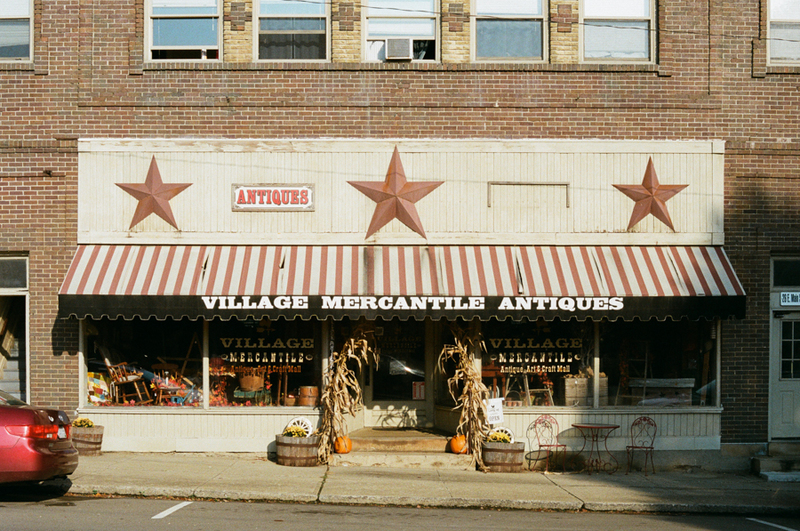 With Cleveland often being the destination, the other side of the state kind of gets left off.